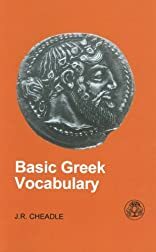 Basic Greek Vocabulary was written by J. R Cheadle. Basic Greek Vocabulary was published by St. Martin's Press. About J. R Cheadle (Author) : J. R Cheadle is a published author. Some of the published credits of J. R Cheadle include Basic Greek Vocabulary.